I’ve seen the criticisms of Mr. Beer online. Many people see it as the over simplification of the process. But I tend to view it more charitably than that. Many might try to ignore it as the EZ-Bake Oven of brewing, but it is a fantastic tool. It teaches patience. It teaches the importance of properly sanitizing everything that comes withing thirty feet of a baby beer. It teaches that brewing isn’t all that complicated, after all mankind has managed for years. And it teaches, most importantly, how fun it can be. In the end, I see Mr. Beer as a gateway drug. Much as the Amber Waves episode of Good Eats (also looked down on among serious hobbyists I learned) can serve as a gateway. The plan had always been to hold onto the Mr. Beer while I was in the apartment. It didn’t take up a lot of space and we didn’t have a lot to give up. 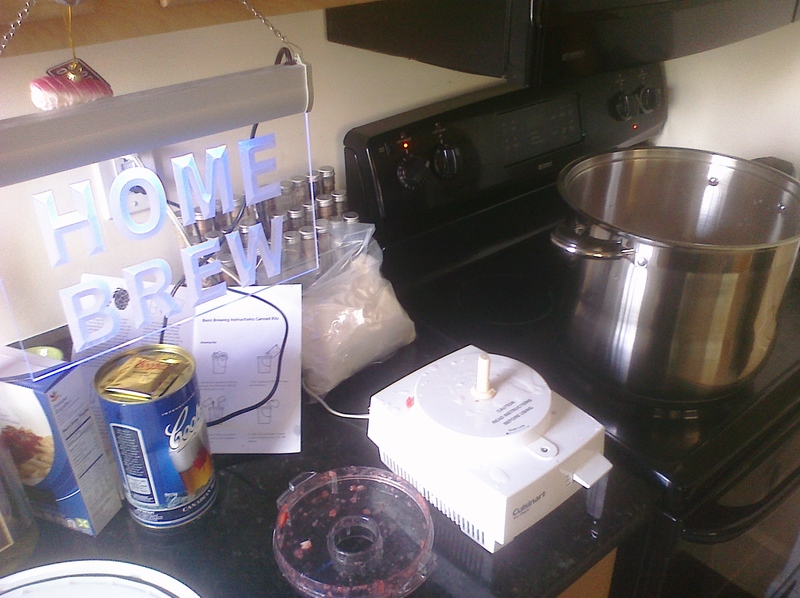 Then, when we got a house, I would get myself a real home brew setup. Well, that plan didn’t take into account the nearly year-long bout of GERD I had, during which both carbonation and alcohol were strictly off my diet. Which meant beer had two strikes against it. Since home brew batches produce massive amounts of beer and since I wanted to be able to partake, it got put off. Then I got better, but it still got put off. Finally one day I realized how long I’d been waiting, so I wandered over to Austin Homebrew’s website, ordered up their simplest starter set of equipment, and waited. The boxes arrived on Thursday. Two of them hanging out on our stoop. One contained two plastic buckets and all the wondrous inventions people have created to make beer brewing easier. The other was a massive stock pot capable of boiling huge quantities of whatever I wanted to boil. Also included was the canned beer kit I selected as my first patch: Cooper’s Canadian Blonde. A Canadian style ale from an Australian home brew company, making a thoroughly international batch. Sunday was brew day. It started by tracking down the cheapest strawberries I could find. Which included discovering I have no fewer than six options of chain grocery stores within about a two mile radius of my house. Because Annandale, Virginia is awesome that way. The strawberries were entirely because my wife and I like fruity beers. So we tend to brew fruity beers. With the old Mr. Beer we created a cherry wheat, a boysenberry stout, and completely failed to create a pumpkin porter (the aforementioned only bad home brew I’ve had to date). There was a temptation to recreate the boysenberry stout, a fantastic beer that we tended to call Pie Stout, but as the beer would be done in summer, we wanted a summery beer. And what says summer more than a nice strawberry blonde. Sign courtesy Day and Renee of Unleaded. So I got everything set up. I got the magic no-rinse cleanser going and soaked everything that needed soaking while my wife processed the 6 pounds of strawberries we got from Bloom ($10, not bad). Then, we pureed. Then, we boiled. Got everything going at a nice boil for 20 minutes to make sure all the strawberry wonderfulness infused into the water, and to make sure that anything that wasn’t a strawberry was dead. I made sure to set up my official HOME BREW sign to make sure everyone in the house knew what was going on. Properly boiled, everything went into the massive plastic bucket. Strawberries. Beer kit. Water up to 6 gallons. Yeast. Hopes. Dreams. Fears. It was all stirred up and the lid pounded on with a nice rubber mallet. See, airtight lids on beer containers are good for two reasons. The first is that they keep out any unwanted wild yeast, or wild anything else. Unless a lambic is the end goal, fine control over what does and doesn’t enter the brew bucket is essential. Tight lids also mean that when walking down carpeted stairs in socks, slipping won’t result in the beer spilling everywhere. I didn’t go all the way down the stairs, but I did slip enough that visions of a tumbling and opening bucket went flashing through my head. The beer sloshed up against the bottom of the lid, but all stayed in. That, after all, is why the lid is included in the list of things to cleanse before starting the process. So the name. As long as I’ve been doing beer at home, I’ve thought of it as “New Peculiar.” The name comes from a Neil Gaiman story: Shoggoth’s Old Peculiar. If you’ve not heard the story, it’s available in three parts on Youtube (link not actually Youtube). He in turn got the name from a product of the Theakston Brewery in England: Theakston’s Old Peculiar. And it is legitimately old, as the recipe has apparently been brewed since the late 19th century. For the first brew I was trying to come up with a good name, perhaps finding the name of a famous strawberry blonde from Canada, when my wife said that, no, the beer would be named Mustache Cat. 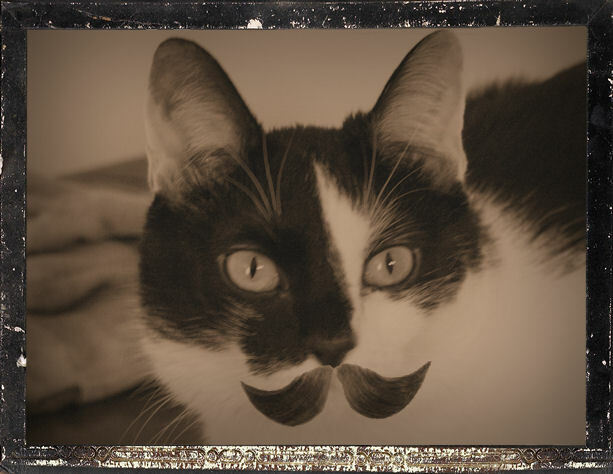 And for the label it would feature our younger cat, Bele, with an old timey mustache. Not coming up with any better ideas myself, I fired up Paint Shop Pro, and Mustache Cat was born. I’m sure there will end up being a more formalized label that just incorporates the picture, but for now all that there is is the picture. I guess I’m going to need to get some way of labeling the bottles. And bottles. Lots of bottles. Six gallons of beer translates to 64 traditional 12-ounce bottles. Thank goodness I live near a home brew store, since I don’t think I’m going to be able to get that many bottles in the three weeks before bottling the old fashioned way. If the beer ends up any good, I’ll end up sharing it. That’s the horrible irony of home brew, one that we learned from Pie Stout. The better the batch, the less you get, because the more you want to show it off. Not sure who among my various circles is a beer drinker, but I suspect there’s no such thing as more home brew than willing drinkers. So there it is. The first batch of DL’s New Peculiar is fermenting. The airlock is bubbling away nicely, meaning I’ve got happy yeast doing what happy yeast do: nobly giving their lives for the conversion of sugar into alcohol. I’ll probably be bottling the second weekend in May, and I’ll make sure to get photos of that process and share them. This entry was posted on April 26, 2011, 3:04 pm and is filed under Home Brew. You can follow any responses to this entry through RSS 2.0. Both comments and pings are currently closed.